The farmhouse ale fit the foraging theme nicely. It's a wild fermented ale made with local hops from a Maine farmer. 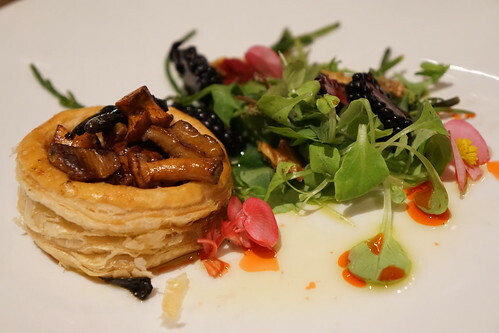 The second course: Losbter and Wild Herbs. The lobster sits on top of a sweet corn panna cotta and served with heirloom tomatoes, sea rocket vinaigrette, wintergreen, wild mint and wood sorrel. This was probably my favorite dish, but that may be obvious seeing how much I love both lobster and sweet corn! 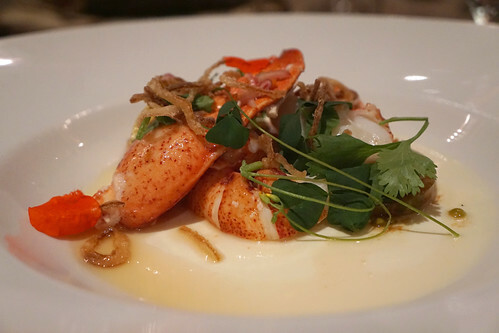 I loved the panna cotta and it complemented the fresh lobster. 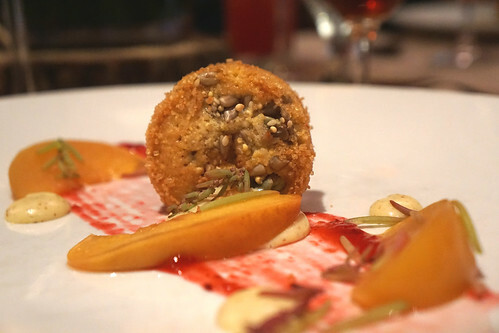 The dish also featured some of the sweetest heirloom tomatoes. 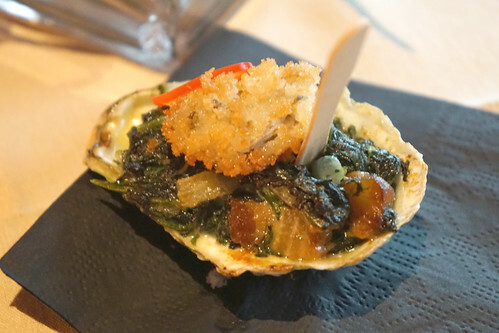 The pairing was spot on as well - the dish was paired with a tequila cocktail made with maraschino, cucumber, wild mint, and french sorrel. "Feral Boar and Forgotten Fruit"
The boar is an invasive species in Colorado and the Post 390 team has made an amazing boar sausage out of it. The reclaimed fruits were decorative apples and pears that have been planted on a fence line and have fallen off. They're not sweet as the eating apples and pears but acted as a nice starch for the dish. 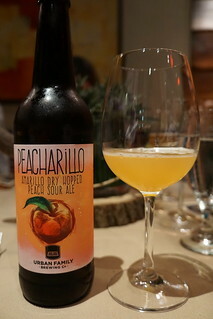 The dish was paired with Urban Family Brewing Peacharillo, a wild ale from Seattle. 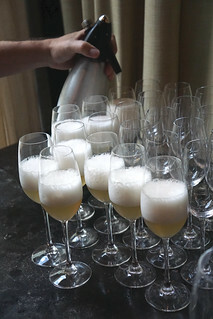 The Himmel Hospitality team recently traveled to Seattle and came across this peach wild ale from Urban Family Brewing. They loved it so much they decided to bring as much as they can back to Boston and managed to save enough to pair it for this dinner. The Peacharillo is a dry hopped sour ale that was 100% spontaneously fermented. For dessert: Nectarines and Cream with Foraged Things (seeded pound cake, candy cap mousse, plum rose jam. The seeded pound cake was made using millet flour, cornmeal, sunflower seeds, and sesame seeds. Paired with a hot sarsaparilla tea and cognac. 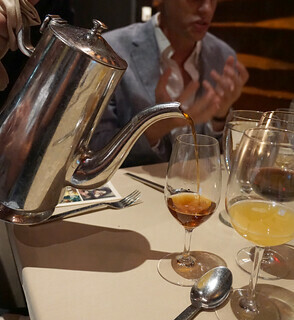 The tea cocktail, made using Pierre Ferrand cognac, was their take on hot toddy. If they'd sell me a whole pot I would totally order it, it was that good. The next Farm to Post dinner (the last one for the year) will be on November 1 and will focus on coffee and chocolate from local roasters. Tickets are $55 per person and includes the cocktail reception and a four-course dinner with beverage pairing - including tax and gratuity. It's a great deal! You can purchase tickets here.